CURVE: Collaborative University Research & Visualization Environment is an ambitious and innovative project to create a technology-rich discovery space and digital scholarship center within Georgia State University Library. At the heart of the Georgia State University campus, the University Library is engaging students, faculty, and staff by connecting them with data sets, unique visualization hardware and software, and the latest online research tools. Over 10,000 students visit the University Library every day, with well over 1.5 million visits per year. CURVE stands out as a resource on the Georgia State University campus for investigators in all disciplines and at all levels. 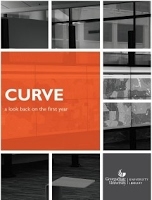 This guide documents CURVE design and planning from early 2013 to its completion in summer of 2014. Visit the current CURVE site for the latest news and projects. View the report of our first-year successes , 2014-15.